Camps for elementary and middle school students (rising-K through grade 7) are fun, varied, and educational. For summer 2017, TNCS will offer both a 2-week Mandarin Chinese language immersion camp and a 2-week Spanish language immersion camp. We are pleased to host two new specialty camps this season. In Week 3, FutureMakers will hold a special 3-day camp, and, in Week 9, we welcome American Music System to our campus. In addition, we welcome back favorite specialty camps such as LEGO Camp, The Painting Workshop, and Camp Invention. See our full schedule below. Sign up for Summer Camp 2017! Please check the eligible ages and camp weeks carefully for specialty camps for rising-K through 7th-grade students; you may not enroll your child in more than one camp in the same week. Note that rising-K students may alternatively enroll in Primary Camp sessions, which run the full 9 weeks of summer camp. This summer, we are pleased to once again welcome The Painting Workshop to TNCS. Open to children who are entering kindergarten through grade 7, these weekly themed camps will inspire your child to embrace the world of art. Sign up for 1 or 2 weeks. In TNCS’s Chinese Immersion Summer Camp program, students entering grades 1 through 7 learn Mandarin Chinese. By communicating in and using the language throughout the day in a variety of modes, they will improve fluency and increase their knowledge. Cultural learning and activities, such as cooking classes, dance performances and lessons, and Chinese drumming, will also be a big part of this fun, stimulating environment. Students will be divided into groups based on age and ability in Mandarin Chinese so that instruction can be tailored to individual needs. Seasoned circus coaches lead campers in a broad range of activities including juggling, stilt walking, unicycle riding, tightrope walking, rolla bolla, walking globe, clowning, acrobatics, aerial arts, and our famous pie-in-the-face day. Hand/eye coordination, balance, and self-confidence all improve as kids realize that with practice and a positive work ethic, they can learn anything. For more information, visit Circus Camp Stars! Dates: July 5 through July 7, 2017; 3-day camp. FutureMakers is a creative space where kids have free rein to innovate. Building prototypes out of their own imaginations, young makers get to see their ideas put into practice! Why play video games, when you can build an old school arcade yourself? Young makers design, build, and play unique arcade games of skill and chance from cardboard, foam, plastics, wood, electronic components, and recycled materials. All projects go home—and be ready, they get big! Join us for our Friday free arcade! Master the basics of designing and building in three take-home projects: a personal container, a box that doubles as a seat, and an original hand-built design. Follow plans, measure, mark, cut, drill, shape, and finish a variety of materials with hand tools. Hosted by Bricks 4 Kidz at TNCS, this popular full-day only camp has kids building and creating in themed morning and afternoon modules. A Pirate’s Quest (Morning): Shiver me timbers as we explore the popular culture behind the life of a pirate. Build a motorized pirate ship, a helm, and an anchor, as we batten down the hatches and prepare for mutiny. Protect the hands on deck by building a launching catapult. Beware me mateys, if it’s too late, you must abandon ship and build a rowboat to escape. Watch out for crocodiles! Anchors aweigh! Classic Arcade Brick Adventures (Afternoon): Jump into the world of classic arcade and video games! Eat flashing dots, collect coins and rings, avoid getting killed by enemies . . . there are so many obstacles to overcome and levels to beat! People today have games with graphic animations and 3D capabilities. Let’s take it back to when it all started, the 1980s! That was the time of 8-bit and, later, 16-bit technology, which gave these old games their classic appearance. Campers will build the famous plumber brothers, a Brick Eater, a jumping hedgehog, alien invaders, and more! Can you guess which classic game each model represents? Bat League—Heroes and Villains (Morning): Enter the dark city where a dangerous jokester and other evil villains wreak havoc. Thankfully there is a bat hero who comes out each night to fight against these evil-doers! The good guys will ride into action as campers build motorized models of the bat hero’s speedy vehicle and bat girl’s sleek motorcycle. But keep the bat light searching for the evil jokester’s motorized low-rider vehicle cruising through the city streets as well. Send the bat hero swinging on his grappling hook technic model from one skyscraper to the next as he fights crime with his trusty super sidekick. Campers will use their imaginations, building skills, and crime-fighting passion in this thrilling camp of bat heroes and villains! World of Amusement (Afternoon): Build adventurous amusement park–themed models. Spend time visiting the Wizard World by building your favorite wizard and his magical owl! Build and give your despicable yellow movie characters a thrilling roller coaster ride! Get your amusement park ticket stamped as you turn games, food, rides, and attractions into exciting model builds! Angry Birdie/Bad Piglet (Morning): Angry Birds is a game about catapulting birds to knock over structures to earn points. Experience the thrill of Angry Birds by building different birds with LEGO® bricks in this fun camp! Kids will build the birds, launch them through the air, build racing karts for them, and more! Students will face new challenges each day, building models and motor-powered machines for their creations. Super Hero Academy (Afternoon): Join Bricks 4 Kidz for a week building Super Heroes with LEGO® bricks. Explore all the caped crusaders and discover their super powers. Create a fantasy world and protect it against all the evil arch enemies with custom contraptions made with LEGO® bricks. American Music System (AMS) camp is a chance to take part in the musical fabric of America with strings instruments violin, viola, cello, or mandolin. In AMS Baltimore, students will benefit from learning from faculty who perform American Music in all parts of the country from old-time music from the Appalachian Mountains to traditional Bluegrass. Students will also have the opportunity to play in ensembles and learn how to improvise—no improvisation experience needed! To learn more about AMS Baltimore, visit: http://baltimoreams.com/. Sign up for 1 or both weeks. 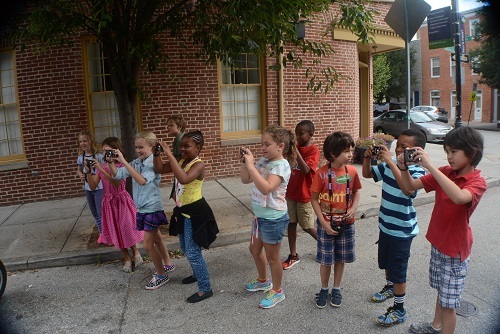 The TNCS Spanish Immersion Summer Camp program for elementary school students offers a fun-filled learning environment where differentiation is built in to daily learning. We offer a challenging and inspiring program to children of different language abilities, from novice to experienced. The entire day will be spent immersed in the Spanish language, experiencing culture through art, literature, cooking, and recreational sports. Join actor, storyteller, and teaching artist Alexandra Hewett for an exploration of Antoine de Saint-Exupery’s classic story The Little Prince. We will work collaboratively to adapt the story for the stage, exploring the themes of celebrating individuality, imagination, and remaining childlike in viewing the world. Participants will be introduced to breath work and relaxation techniques, vocal and moment exercises, improvisation, character development, and theatre games. A final presentation takes place on the last day of the camp.